A patch of waterfront in the Yukon was a hunting and fishing ground for a native tribe in Canada back in the late 19th century. But when gold was discovered, triggering a rush of settlement, Dawson City emerged. The people also wanted the innovative new entertainment known as movies. But as the end of the line for film distribution systems, Dawson City would get reels that were several years old -- and by that time, it was too expensive to ship them back. So they'd typically sit in storage or -- being highly-flammable nitrate film stock -- go up in flames, taking down buildings with them. The only safe recourse was to trash them. Those reels that weren't tossed into the Yukon River were used as landfill, which is where they sat -- frozen in the tundra for several decades until, in 1978, a construction crew came upon a stash of more than 500 nitrate reels buried at the site of an old theatre. Among the haul: At least 372 silent features, many of which had not otherwise survived in any form. Bill Morrison's new documentary, "Dawson City: Frozen Time" (which has its North American premiere at the New York Film Festival today), includes excerpts from these found films -- melodramas, slapstick comedies, newsreels, travelogues -- which had delighted Dawsonites a century ago and then vanished. 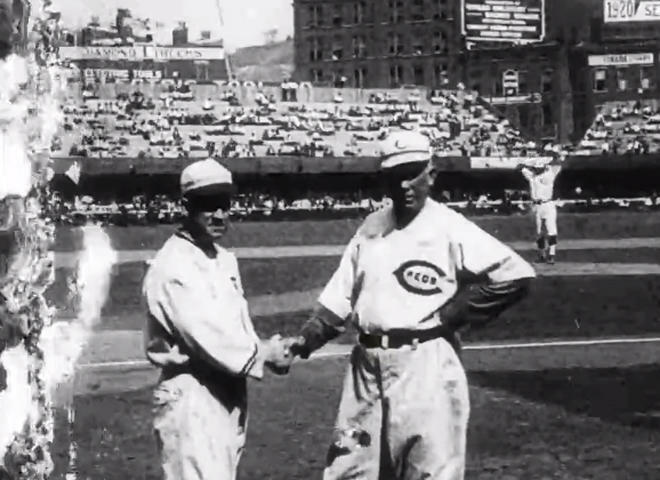 Among the finds: Footage of the infamous 1919 "Black Sox" World Series. The films suffered water damage and other degradation, so the frames are fraught with stains, tears, dirt and chemical decomposition. Projected anew, the imagery pulsates as if by the energy of a flickering heart. But the movie is more than a clip reel. By using period photographs (including glass negatives which were saved by conservators from being converted into greenhouse windows), a history of Dawson City is conjured, filled with dreamy visions and ironic nostalgia. The serendipity of history, commerce and culture are revealed. From "Dawson City: Frozen Time"
The initial impression is that there is too much information -- do we need to know the names of those who built meeting halls and played on the local hockey team in the 1910s? But the threads of the story gradually emerge, connecting the birth, life and death of the town to its re-birth for us as visualized in the nitrate film discovery. Morrison (whose 2002 documentary "Decasia" is on the Library of Congress' National Film Registry) takes the DNA of cinema's origin -- an ephemeral commodity meant for diversion -- and turns it into a timeless treasure, mined (like gold) from the Yukon's landscape. The flickering images and still photographs of a time outside of time are matched by the haunting score created by Icelandic composer Alex Somers and sound designer John Somers. It is music that mirrors the disintegration and degradation of nitrate frames depicting vanished landscapes and people long dead -- ghostly music without the horror. "Dawson City: Frozen Time" (Hypnotic Pictures and Picture Palace Pictures, in association with ARTE-La Lucarne and the Museum of Modern Art) will be screened at the New York Film Festival on October 2 and 4. Future screenings around the U.S. or via VOD are still to be announced. 120 mins. UPDATE: "Dawson City: Frozen Time" is being released by Kino Lorber, and will open in theatres in New York City (June 9, 2017), Los Angeles, Chicago and San Diego (June 16), Hartford, Conn. (June 30), Philadelphia (July 14), and Toronto and Vancouver (July 21). Other cities and dates are to be announced. For more information visit the Kino Lorber website. A mother-daughter bond shattered in Pedro Almodóvar's "Julieta"
Heart-wrenching "Manchester by the Sea"
Haunting imagery of "Dawson City: Frozen Time"
Poets as heroes in "Paterson," "Neruda"
The interrupted lives of "Certain Women"